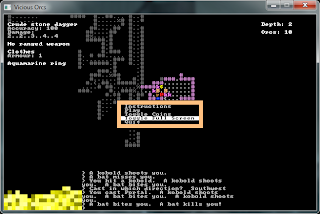 I decided to try a roguelike that uses libtcod for a change and ended up downloading Jeff Lait's "once again even still yet another" 7DRL, Vicious Orcs, one of the last year's entries. "Your remote mountain village is snowed in awaiting the pass to clear when an earthquake strikes, revealing a new cave complex. It so happens that tales in the village have told of such a cave complex many generations ago. 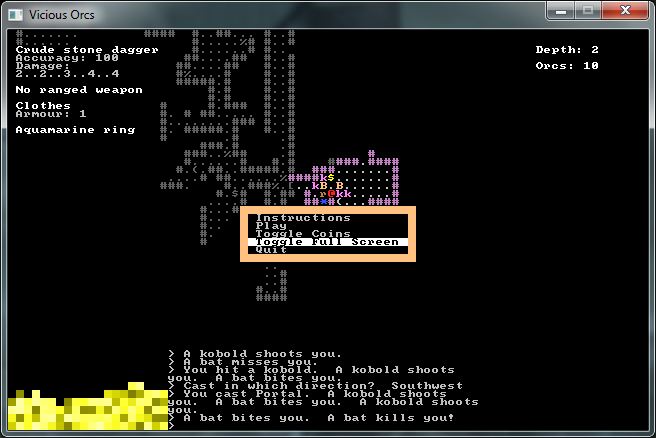 That time vicious orcs stormed out and attacked the defenseless villagers. This time, you are here." "Since the rest of the villagers are too fearful or too doubtful to make a foray into the caverns, it is up to you to explore their depths and rid the village of this threat." I managed to beat the game on my second try. Once I learned to deal with the firing shooting kobolds, and that you're s'posed to take the found broken gear into the town for repairing, the rest was a breeze. The actual town I found after using the portal spell for the first time -- you start at the cave entrance and I entered it right away, without exploring the surface map. The victory didn't feel like a victory, however. After doing some research, I think I got the bad ending, and there's a better one. I merely skimmed through the rgrd thread, and didn't quite found out how you achieve it; talk about obscure references chased my interest away. Maybe the good ending is earned by playing the game in a more difficult way? I liked the twist, though. Technically, Vicious Orcs is pretty interesting. I guess Mr. Lait used his old projects (since his 2009 7DRL, Jacob's Matrix, was about portals) as a base, but as I haven't tried any of them (yet anyway), I can't really say. What I can say, though, is that seeing the cavern curve under the tunnel you came from was quite unexpected. I had to backtrack just to make sure that actually happened. It can get confusing at times, too, with how the display remembers seen tiles and overwrites the positions you are currently seeing. Without corpses lying on the ground it might get rather difficult to remember where you have already been. Collected coins dropping from the top left of the screen and piling up on the bottom is a nice detail. The overall look of the game is very nice for a 7DRL, and the interface is accessible. One minor but cool feature is how the game corrects the direction you are trying to move when walking into a wall. It seems to work amazingly well and I think I'll have to include that in my future projects. I feel my positive experience with Vicious Orcs encourages me to try another of Lait's games. In fact, I think the next monthly roguelike might quite well be Jacob's Matrix.